RATE IT! Sprinkle A Little Fun! Think men and women have trouble communicating? This Funny or Die video 'nails' it (yes, that pun is intended!). After a lengthy wait, and enough red tape to encircle the globe several times, the Toronto Zoo is now home to two gorgeous Giant Pandas from China! Da Mao (a 4-year-old male), and Er Shun (an older woman at 5 years of age) are settling in nicely for their 5 year stay. On the day that we visited, Da Mao was holding court in the outside enclosure. Sitting in the shade, climbing on rocks and picking just the right piece of bamboo to chomp, he seemed completely oblivious to the crowds of children and adults who were clamouring to see him. Er Shun was more playful in the inside enclosure, doing her gymnastic routine of front rolls much to the delight and appreciative squeals of her audience. If you're in Toronto in the near future, go see these wonderful bears! And check out the other animals that call the Toronto Zoo home. Well worth the visit. I'm the last person who would call working out "fun", but I do know that a wicked playlist of tunes can make breaking a sweat somewhat bearable. 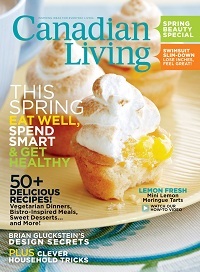 If you're looking for inspiration or tips on how to create the perfect exercise playlist, my new article on the website of Canadian Living magazine, might be just the thing to put a bounce in your step. My love of all things British gets me into financial trouble sometimes. I often find something unique from abroad that I just have to have even if a frightening credit card bill, and import duty charge loom in my future. 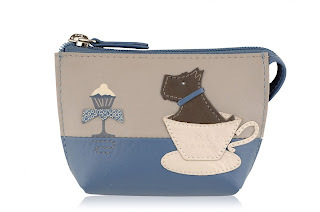 During one of my regular visits to the website of Radley, one of the UK's foremost retailers of gorgeously grown up leather bags, I discovered their "Teatime" line - a cute selection of items characterized by Radley's trademark Scotty dog sitting cozily in a tea cup. Well, I'm a big fan of Radley (and the Scotty), as well as the TV series, 'New Girl' and the first thing that popped into my head when I spotted this product was the 'Menzies' episode from season 2. Jess (played by the exquisite Zooey Deschanel) hilariously breaks into tears during a job interview over a framed photograph of a deceased Yorkshire Terrier sat in a tea cup. I can't help myself. I LOVE this change purse, and this episode ALWAYS makes me laugh out loud. And just like that, my credit card took a direct hit. But really, can you blame me? Bring some cuteness to your dinner table. Whimsical salt and pepper shakers certainly aren't new, but this set from ModCloth are guaranteed to start your day sunny side up! Hello. Remember me? After a few years where family concerns had to take precedence, I am BACK and I have a lot to share in regards to pop culture and all the fun products out there that put a smile on my face (and hopefully, yours!). I hope you'll come along for the ride!